1. Little Red Riding Hood: When Prince Charming was at the tower, Wolf was there instead of Fiona. 2. Little Red Riding Hood: She knocks the door and Shrek opens, she runs away in fear leaving her basket behind. 3. Grimm Brothers: When the Fairy Godmother said "What in Grimm's name are you doing here?" 4. The Frog Prince: Fiona's father. 5. The Legend of Sleepy Hollow: The Headless Horseman. 6. Jack and Jill: The girl who says "Here, I fetched you a pail of water". 7. 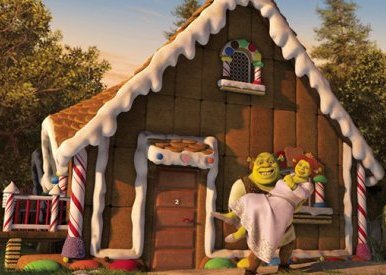 Hansel & Gretel: The candy house where Shrek and Fiona spend their honeymoon (Hansel's Honeymoon Hideout). 8. Tom Thumb and Thumbelina: On the Red carpet. 9. Puss n Boots: Well, in case that you don't know Puss n Boots (in the original fairy tale) got rid of an ogre. 10. Puss n Boots: When human Shrek, Puss and Horse Donkey steal the clothes. 11. The Three Little Pigs: Obvious (Yah!). 12. Rapunzel: Her Beverly Hills Mansion.